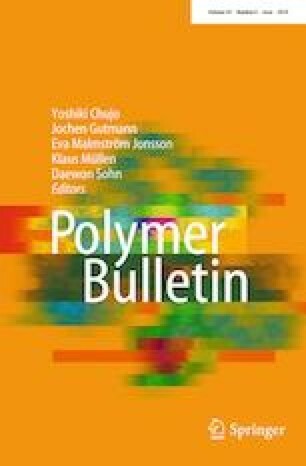 A novel polyaniline/Ni0.4Zn0.4Co0.2Fe2O4 (PANI/NZCF) composite was synthesized by in situ polymerization of aniline in the presence of NZCF. The studies of structural, morphological and surface chemical bonding states were performed by X-ray diffraction, scanning electron microscopy and Fourier transform-infrared spectrometry, respectively. It was found that greater reflection loss and wider absorption bandwidths were possible by adjusting the mass ratio of NZCF to PANI on account of electromagnetic loss and impedance matching. The highest reflection loss (RL) was − 40 dB at the frequency 15.8 GHz for the PANI/NZCF composite when the effective absorption frequency at which RL < − 10 dB was in the range of 13.5–18 GHz with an absorber thickness of 1.7 mm at the mass ratio of 2:1. These effects are due to the urchin-like structure when compared to traditional encapsulation structures. Therefore, the above findings show that the PANI/NZCF composite with negligible thickness and strong absorption properties has great potential in the application of electromagnetic shielding and microwave absorbing. This work was supported by the National Natural Science Foundation of China (51672129, 51702158 and 11502110), Natural Science Foundation of Jiangsu Province of China (BK20150737), the Fundamental Research Funds for the Central Universities (NS2017036) and Hong Kong Scholars Program. The authors thank Dr. Azhar Ali Haidry, foreign expert in functional materials and associate professor in our college, for his valuable suggestions and revision to improve the English of the manuscript. The authors also thank Dr. Shasha Zhang for her suggestion.